Regenerere Corviale by Laura Peretti Architects (Italy). Peretti reflects on the regeneration of a 1970s, kilometre-long social housing megastructure housing 7,000 occupants. This infrastructural “freespace” understands the city as a means to harmonize topography and allow for public democratic spaces to establish strong connections with nature. A set of captivating screens slowly slip and slide on suspended wires, allowing a glimpse into this heroic landscape. These images give form to Peretti’s vision and imaginative undertaking. Pinós’ series of architectural acecdotes explores the Cube office tower in the Mexican city of Guadalajara. Like looking into the mind of the architect, we become privy to the deep-thinking and iterative processes that allow Pinós to transform, re-conceptualize and uncover new form-making. Striking a balance between abstraction and fluidity, where – as the architect suggests – one “action rebounds off another, transforming it and generating a new one,” Pinos collapses the boundary between the conceptual ideas and technical resolutions of the tall building. Considering the home as humankind’s most fundamental and central experience of architecture, Alison Brooks explores form and scale in Recasting. By mimicking four types from her practice, Brooks creates a manifesto for critical Freespace as sensory – her crafted timber forms are suggestive of the many transitional spaces that allow for feelings of safety and identity. Moving between threshold, passage, facade and roof, an informal stage allows viewers to take an outward-facing and reflective position within the work. “Wisdom of the Land” by Marina Tabassum, Marina Tabassum Architects (Bangladesh). 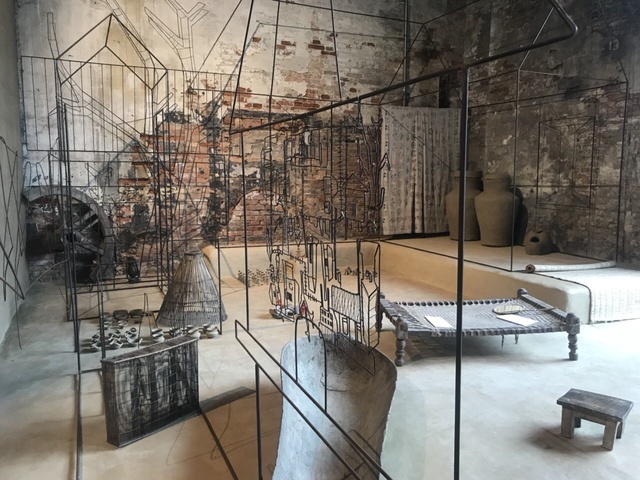 With a focus on the Bengali courtyard, Tabassum’s contribution to the Arsenale is striking for its craft and vernacular positioning of the uthan, or “lived space.” Tabassum’s spatial process is revealed in a curated series of objects appearing much like a stage set. Household items are positioned as elements of daily life and give insight into the community rituals and the people who perform them. Tabassum’s work reflects on the community housing projects she is undertaking in Bangladesh where observation and respect are critical. 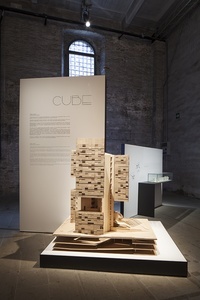 Weaving techniques and their application are central to the work of Benedetta Tagliabue and provide a way to experiment with pattern and identity. 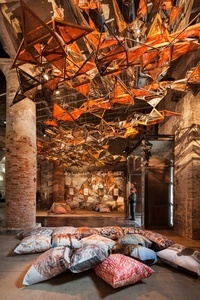 The installation at the Arsenale creates a space of repose where bodies lie under a woven canopy, taking inspiration from a flock of birds. This installation draws on a commission for a new metro station in the outskirts of Paris but reflects Tagliabue’s commitment to decoration and colour as a way to bring life and engagement to liminal places.